Wow! This collar and cuffs must be from the teens, so around 90 years old. They are in the the style popular before the end of WWI. There are no brown spots, so they may never have been worn. I need to wash them to get the folds out, since linen is one of those fabrics that remembers creases until laundered. It must have been made to go over a blouse. I can’t imagine the corset would be allowed to show through the lace down the center front. One thing to note is the way the lace down the front is split to go up the front of each collar edge. 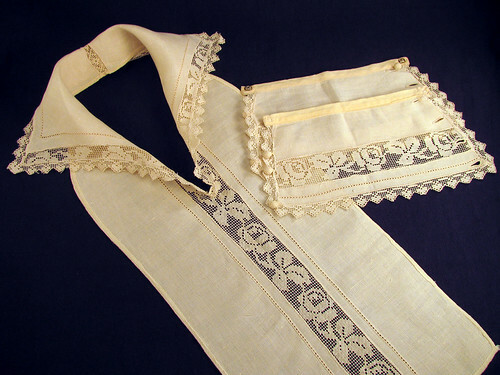 It makes a wider lace trim on the edges of the collar and makes the transition between the front of the garment and the split for the head opening smooth. The cuffs have crocheted buttons that fasten like French cuffs. The top button is sewn onto the top button hole, so is merely decorative. A piece of filet lace is also used as an insertion at the center back neck, so the hair would most likely have been worn up. A pretty set from the past. This entry was posted on Monday, March 16th, 2009 at 3:00 am and is filed under Lace, Sewing and Vintage. Tagged: Clothing, Lace, Vintage. You can feed this entry. You can leave a response, or trackback from your own site. Beautiful! The cuffs would be wonderful peeking underneath the sleeve of a blazer.